Home » MLSP News » 8 Ways MLSP Lifts Up & Protects Its Members and Affiliates… So You Can Get More Customers, Sales & Sign-Ups for YOUR Business! 8 Ways MLSP Lifts Up & Protects Its Members and Affiliates… So You Can Get More Customers, Sales & Sign-Ups for YOUR Business! We want to start this post by saying thank you to our members and affiliates for being a part of the MyLeadSystemPRO Vision, Mission and Community; and for trusting us to provide you with the training and solutions you require to grow your business. You should know that the MLSP Corporate Team bleeds this community, and we passionately do EVERYTHING we possibly can to help you create your dream business (and life). MyLeadSystemPRO flourishes as we create more leaders and develop more success stories, which has been our #1 priority here at MLSP since we opened our doors for business back in 2008. We have recently received a few support tickets asking exactly how the MLSP affiliate software works. So we wanted to take a moment to be 100% transparent with the community, as always, and dive into the MLSP proprietary technology we created to make sure everything gets tracked back to our affiliates correctly YOU generate the leads, YOU build YOUR list, YOU get the sales & sign-ups, and YOU earn MLSP affiliate commissions. We’ve guarded these secrets for a long time, due to not wanting competitors know what all we do to protect our affiliates, but now the time has come to remove this veil and tell all. MyLeadSystemPRO values its PEOPLE (members and affiliates) more than anything in the world. The MLSP family atmosphere, culture and community is unbelievably supportive and caring; and MLSP does whatever it takes to protect its members’ and affiliates’ interests like a honey badger protects its offspring! We continue to work hard to implement new and innovative solutions for our affiliates, and throughout our 10 year history, we have broken ground on a lot of ‘firsts’ in this industry as well as others. It’s not just the corporate team however that confirms, tests, and monitors the system. We have a leadership council comprised of industry top earners that are champions for MLSP just as much as we are. Their ability to have ears on the ground, push the system to its limits and have constant access to us and our team ensures that your system works as it should; and if bugs or glitches potentially arise, that they are handled quickly and updated incredibly fast. Since 2008 it’s been the relationships MLSP has developed that have helped collectively create the biggest leaders you see online today, and why MLSP has become the #1 Attraction Marketing System for home business professionals. How can we make MyLeadSystemPRO better for our members and affiliates! We want to take a moment to show you the steps that many other affiliate systems refuse to take in order to protect their affiliates, and what separates the MLSP brand from the rest. take your 100% risk-free test drive here. The MLSP platform runs on proprietary marketing ‘MLSP Sticky Cookies’ that stay on your prospect’s device / browser for 365 days. What this means is that when you bring a visitor to the MLSP corporate website, or to one of the high-converting MLSP capture pages, a ‘MLSP Sticky Cookie’ is dropped on that user’s device. If and when that user is on their same mobile device or computer… and comes back to MLSP.com (or any of our web campaigns & funnels) to take the risk-free test drive (or buy any of our products & services), our affiliates get credit… and our affiliates get paid! And ‘MLSP Sticky Cookies’ don’t just last the industry standard of 7-30 days - they last a full 365 days to help you track your prospects, get sales, and earn MLSP affiliate commissions! MLSP uses proprietary software to track visitors and leads generated within the MLSP system. We aren’t able to get super detailed here as this is one thing that will set MLSP apart from any affiliate tracking system out there in the market today. Anytime a visitor enters any data on a MLSP site (name and email, for example), that information is tracked to whoever generated that lead, and is then used to later link up to the correct referring affiliate if there is not a valid ‘MLSP Sticky Cookie’ found on the user’s device. This is yet another way MLSP is able to link up buyers with the appropriate affiliate to ensure our affiliates get credited with the proper commissions. MLSP is scientifically engineered to help affiliates get more leads and make more money, and one of the best ways to accomplish that is through the powerful MLSP Corporate Blog. In 2016, we pioneered an effort to implement one of the FIRST ‘affiliate ready’ blogs in the industry. No one had EVER done this before. While it was in beta, we worked tirelessly testing and innovating in order to get it to where it is today with the help of our leadership council, members, and affiliates. The MLSP Corporate Blog has some of the most valuable content for home business owners...period. From internet marketing to traffic strategies and paid advertising, to prospecting and recruiting, mindset and personal growth; MLSP affiliates & members can share the MLSP Corporate blog posts to provide incredible value to their audience. What’s really special is that when a member and affiliate share the MLSP blog posts, the MLSP member gets the lead’s contact information put into their personal autoresponder and the proprietary MLSP CRM (customer relationship software). And when the lead buys, the affiliate gets credit for any MLSP sales! Basically an MLSP member and affiliate can share extremely valuable 3,000 - 5,000 word blog posts that add real value to real people with real problems… and when a prospect enters their name and email into any of the offers on the blog, the affiliate gets the lead, and the sale! One of the biggest pains and challenges for home business owners is that they don’t have valuable stuff to offer their potential prospects… yet. This is really the core of MLSP’s Attraction Marketing philosophy: to actually deliver VALUE and SOLVE THE PROBLEMS of your target audience instead of pitching and spamming on Facebook. And when we talk about creating instant VALUE for YOUR target audience, that’s where the beautiful MLSP Lead Magnets and Capture Pages come in! Imagine being able to give away a FREE Facebook LIVE Training, or a FREE Facebook Paid Ads Training, or a FREE Twitter Traffic & Automation Training even if you’re brand new? Examples of some MLSP Training ('Lead Magnets') available for members to give away! And as a value add to our MLSP members, you get to generate the lead onto your own personal email list. This way, you can follow up, build a relationship with, and introduce YOUR products and services! #BRILLIANT! Remarketing or Retargeting is when someone visits a website and a pixel is fired. That pixel allows you to show that prospect a ‘retargeting’ ad the next time they log into Facebook (we’ll use Facebook as an example, but there is a ton of other retargeting software out there as well). This is extremely effective, and one of the highest converting forms of advertising online today because the prospect has already been introduced to your brand! This is the secret marketing strategy of mega brands like Apple and Nike, and MLSP actually does this for you! Here’s where MLSP comes into play with remarketing and retargeting to help YOU, our beautiful affiliate. YES, MLSP spends a tiny fortune every single month to pay for ads and traffic. In fact, if you are with a company that doesn’t split test their own offers to make sure YOU get the best high-converting lead-generation funnels, RUN and RUN FAST! Seriously, you deserve that as a marketer. When a company is able to advertise itself in order to make a profit, then the market speaks for itself as that company is profitable with its affiliates as well as without. This is where the GOLD lives…. Brand awareness and brand advertising is the BEST way to keep a brand in the forefront of a prospect’s mind after they initially visit a website. This is EXACTLY what retargeting advertising does for a brand. Why do you think HUGE brands like Budweiser and Coca-Cola spend MILLIONS of dollars on a SINGLE sports game ad just to have their name listed……brand awareness. As stated above, MLSP does a LOT of paid corporate advertising to grow the community, and get our tools, software, and solutions in the hands of as many home business owners as possible. And as stated above THIS IS CRITICAL if you are going to promote a company because you need to know that the offers convert before YOU spend YOUR hard earned cash on ads. But check this out… with ALL of our marketing efforts we NEVER override YOUR efforts. What we mean by that is if someone found your MLSP website or blog post, and then they click an MLSP Corporate Ad later that week on Facebook, , the MLSP corporate usernames are worthless and do NOT override YOUR marketing efforts. What this proves is that YES, while we are always spending money on ads, tracking, split-testing, and the constant and never-ending improvement of our offers to help our affiliates out in every way possible… the MLSP Corporate account will never override YOUR affiliates cookies! So if you have an advertising effort or a cookie dropped on ANY user, and / or if you have generated that person as a lead in the MLSP database, YOU would still get credit for all sales and sign-ups. And guess what…...this also works the SAME way on ALL of our proprietary affiliate tracking methods. We work very hard to ensure that our affiliates get the credit they deserve. MLSP has proprietary checks in place so, even if your cookie has expired, if a user is signing up or purchasing a product/service from us, we’ll scour our database for the data used to sign-up, and if the information is shown to have been generated by one of our affiliates, we’ll gladly tag that referral to them! Again, just another unique tweak to the MLSP Affiliate Software. We go the extra mile so our affiliates get the best… because we believe they deserve it! At the end of the day, Attraction Marketing is the MLSP philosophy. If you are embracing Attraction Marketing, the idea is that YOU are building the relationship with your tribe, and they are buying from YOU. If you are giving your prospect a link through an ad and/or a Facebook messenger conversation, and they know who you are because you have embraced ‘Attraction Marketing’ through the MLSP Framework, then your prospects will be much more conscious of the fact that they want to sign up with YOU through your direct link (and nobody else). This is all possible when you embrace the exact same MLSP Attraction Marketing Framework that has created more leaders than any other training platform online today… versus spamming and pitching opportunity links on Facebook! This is the SINGLE most important aspect of marketing that most affiliates and marketers actually miss. We have multiple trainings and entire courses on this very subject in the back-office of MLSP. MLSP can be a long-term residual type of affiliate income for marketers because of this critical key component with our MLSP affiliate program. And when you combine the fact that MLSP has a VERY profitable affiliate program with all the monthly memberships, tools, and trainings… PLUS the fact that MLSP launches brand new products every 6-8 weeks… this is a VERY big deal to your bottom line, and your bank account! Our goal is to help you create that long-term mailbox money as an MLSP affiliate, and now it’s possible with our ‘Linked for Life’ affiliate program, again, as long as you are an active affiliate with MLSP. With the help of our Leadership Council and our support staff and ticketing service, if bugs do potentially arise with any new updates (which can happen with the internet and new technology), our members and affiliates only need to take two minutes to send our friendly support team a quick email… and we’ll solve the issue right away. Again, we want to thank our members and affiliates for helping cultivate the heart and soul of what makes MLSP so special. This training system was built by marketers, for marketers, and our users are at the crux of every decision we make. We will ALWAYS stay true to our core values of Integrity, Culture, and Growth. We will continue to innovate, test out new technologies and place new tools in the hands of our affiliates. 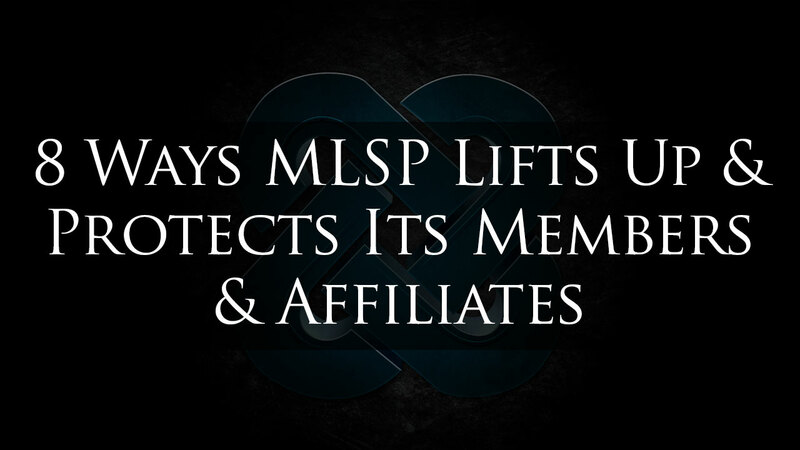 These are 8 ways MLSP lifts up and protects its members & affiliates… No other system or affiliate platform even comes close. And we will protect YOU, our MLSP family members, to the death. YOU are why we do what we do. And we love you. P.S. – If you are ready to take YOUR video marketing strategy and business to the next level, Click Here to Unlock the Top Earner System to Grow YOUR Business! MLSP is the online equivalent to the world-class Harvard school of business for entrepreneurs who want to get more leads, sign-up more reps, and make more money in any home business. With the incredible MLSP community, websites, tools, and technology you can build your business faster, smarter, and exactly like the 6- and 7-figure earners starting today. Not only is MLSP a top notch training and affiliate program, it is a top notch leadership developement program. The founders have gone out of their way to show us how to rise above and be the best that we can be! They care! Pure and simple! It isn’t all about the dollar. The community that has been formed here at MLSP is a huge reason why I have grown in my faith and in myself. I’m here for them just as much as they are here for me!!! Thank you so much for the kind words Kathy! 3 STEP TOP EARNER FRAMEWORK? 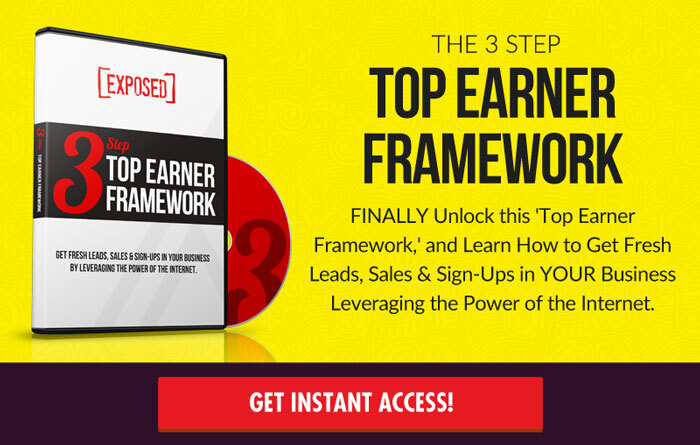 FINALLY Unlock this 'Top Earner Framework,' and Learn How to Get Fresh Leads, Sales & Sign-Ups in YOUR Business Leveraging the Power of the Internet. Prospecting on LinkedIn: 5 Strategies to Leverage This Massively Untapped Platform for Highly Qualified Leads! The Ultimate Webinar Script: Use this 7-Step Webinar Framework for a Flood of Sales & Sign-Ups! How to Market on Instagram: 3 Simple Steps to Get Followers, Massive Engagement, and Sales! Attraction Marketing Formula – 99% of Businesses Stay Broke without this Formula! Network Marketing Success: 5 Key Skills to Get More Prospects, Customers, and Reps for YOUR Business Today! Facebook Retargeting Ads: Amazon’s #1 Secret to Legally Follow Your Website Visitors until they Buy Your Stuff! Prospecting on Facebook: 5 Simple Steps to Attract Prospects to YOU Everyday! How to Start a Podcast: 9 Proven Strategies to Create, Promote, & Monetize a Successful Podcast! Are you interested in what MLSP can do for you and your business? Head over to myleadsystempro.com to learn more about us! Or join the team today! Have some questions for us? We'd love to hear from you! Please contact [email protected].